Last April, niche line By Kilian launched Flower of Immortality as the third fragrance in its Asian Tales collection. Like the other two fragrances in the collection, Bamboo Harmony and Water Calligraphy, Flower of Immortality was developed by perfumer Calice Becker. It is an homage to the peach blossom, a symbol of immortality and hospitality in Asian folklore, and was inspired specifically by the Chinese story "A Tale of the Fountain of the Peach Blossom Spring." Flower of Immortality is a fruity floral with notes of white peach, carrot, iris, blackcurrant bud, rose crystal, tonka bean and vanilla bean. It does what it promises, balancing those "smooth and juicy" fruit notes with its "sweet and powdery" florals. Don't let the carrot scare you off: it's not identifiable as a separate note. What you'll really experience is the peach, and plenty of it. 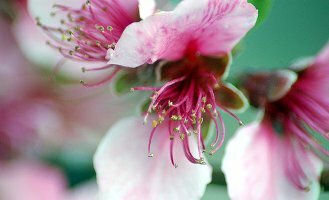 Even though this fragrance supposedly honors the flower of the peach tree, the fruit plays the central role. The rose note is appealing, but subtle; there's a soft suede-like effect in the dry-down. Everything is nicely blended together, and the ingredients seem to be good quality; the overall result is a pleasant composition, if not a terribly striking one. When Kevin reviewed Bamboo Harmony and Water Calligraphy, he admitted to hoping that Asian Tales would turn out to be "truly an ‘Asian-infused’ line and not a line geared toward Asian consumers (who, we are told by marketers, prefer modern, super-light, non-perfume perfumes)." Flower of Immortality isn't quite as fresh and clean as Bamboo Harmony and Water Calligraphy, but it still feels awfully mild for a niche fragrance at this price point. It almost made me nostalgic for the over-the-top, baroque fragrances of Kilian's inaugural L'Oeuvre Noire collection (of which Liaisons Dangereuses is my favorite). If I were to purchase a pretty, wearable peach-themed fragrance right now, I'd opt instead for Providence Perfume Co's Mousseline Pêche or the mass-market classic Lancôme Trésor. It's not that I don't enjoy Flower of Immortality; I just keep thinking of ways that this perfume could have been given a stronger personality. I wouldn't mind more white florals, or more vanilla, or how about some spice? maybe some ginger or cardamom? Come to think of it, the fragrance in my imagination already exists: it's called Chinatown. By Kilian Flower of Immortality is available as 50 ml ($235 with bottle and box, or $135 just for a plain refill bottle) and 30 ml ($145 for travel spray with refills) Eau de Parfum. For purchasing information, see the listing for By Kilian under Perfume Houses. Note: image is Peach blossoms coming to an end [cropped] by Carly & Art at flickr; some rights reserved. I love Bamboo Harmony and found FOI pleasant…I would have to find my sample and re-sniff it to remember exactly what I felt for it..but I do remember a pleasant peach. I am actually testing out Visa today..which I find to be a rich, cozy, powdery peach. Overly ripe peaches, sickly sweet. Not sure if that’s my thing…I do like the coziness of it though. “I do remember a pleasant peach” would be my six-word review of this one. Visa probably has more oomph! My favorite Kilian, too – would love to hear your take on it in a review, Jessica. I’ll have to put this on my to-review list, then! I was initially so turned off by the whole BK presentation that I took my time trying out that first collection. I do like several of them, though… especially in comparison to the more recent releases. i think my favorite “asian” perfumes are tom ford’s plum japonais and hermes’ osmanthe yunnan. I’m glad to hear it’s innocuous. The list of ingredients made me barf. I have not tried any of the BKs because of the price, but I love a review that calls it like it sees it. Fancy mentioning Tresor in a By Kilian review! But I actually *like* Tresor, in small doses. And I like Jo Malone’s Nectarine Blossom and Honey, and other peachy fragrances. This one just doesn’t deliver on its promise, especially for the price. If I’m going to spend that much on a fragrance, it had better *move* me, and this one just didn’t. Ok, is it just me or is Tresor A LOT more sweet than it used to be? Smelling it recently…I was just eck..so sweet. Yes, I can’t go near it. I should really try that JM; love honey fragrances. Love Nectarine Blossom and Honey by Jo Malone. Love Tresor – also in small does. I was disappointed with Flower of Immortality and certainly won’t purchase it at that By Kilian price point either. I would by Nectarine Blossom by Jo Malone over Flower of Immortality any day. The Jo Malone does what it promises, for a pretty reasonable price! Its staying power isn’t great, but it’s a “cologne,” so that’s not a surprise. I had a sample of FoI that someone gave me. It was ok. Pleasant but not nearly interesting enough for that price. I gave the sample away. At the time I also had a sample of Bas de Soie and tried layering them on a whim. Peach and iris is a great combo, so the two were really gorgeous together. Oh, that does sound interesting. And I like Bas de Soie! I won a sample of this over at the Posse. I experienced an initial blast of white peach and then it faded to nothingness after about 20 minutes. At the price, I expected it to be longer lasting but it was the exact opposite of immortal, barely the lifespan of a gnat! Oh, perfect — you’re right, it’s ironic that a fragrance alluding to immortality has low staying power! Several of the original Calice Becker BKs are among my all-time favs, and Liaisons Dangereuses is one of those. I haven’t liked anything since Pure Oud and Rose Oud. Denise had intriguing things to say about the new CB BK, Playing with the Devil, on Grain de Musc. I’ll give it a try although I was really disappointed by Flower of Immortality. The peach is too artificial smelling to my nose. I’ll go check out some of Denyse’s BK reviews! I always enjoy her take on things. I think the writer missed the point here… ByKilian actually wanted to create perfumes FOR the Asians and that they will actually buy, therefore he created this line ( what the SA told me ). therefore, the perfumes in this line are fresh, light. floral, soft fruity, – just the way Asians like their perfumes. Therefore there really is no point adding ginger, spice – which goes against the point of the whole Asian line. And I used to think the same thing – so I asked my Asian friend – and she said that she wouldnt have purchased this perfume if it had those notes in there. I don’t think the writer missed the point — as I mentioned in the review, Kevin and I were both aware that this collection was likely targeted at an Asian-Pacific audience (just as Kilian’s oud fragrances were released with an eye to the Middle Eastern market), but we hoped that it wouldn’t *just* be a set of clean-and-fruity fragrances. One, it’s offered for sale worldwide, so it’s obviously not exclusively created for an Asian market; two, I’m sure that Asians don’t need a fragrance collection to have an Asian *theme* to appeal to them; and three, Western perfume consumers have responded to fragrances with Asian themes since Mitsouko (if not earlier). You probably know more about the contemporary Asian beauty market than I do, but the fact that I wished for a more complex, price-worthy fragrance doesn’t mean I missed the point. It just means I’m too optimistic!